Is Carrying Storm Sails on Your Cruising Boat Really Necessary? 3. Should be highly visible against a grey and white sea. Every offshore cruising boat should carry a storm jib and trysail. Hove-to under these sails, a well-found yacht should be capable of riding out all but nature’s most testing conditions. Long-keelers will heave-to like somnolent ducks, but fin and skeg sloops may find the required sail balance difficult to achieve with the storm jib set on the forestay, or on a removable inner forestay set immediately aft of it. Ideally an inner forestay rigged about one third of the J measurement aft of the forestay should be available for a storm jib. A spare jib halyard must be used – not the spinnaker halyard which will chafe on the forestay, where its ultimate failure will be but a matter of time. Owners of cutters who’ve resisted the temptation to install their staysail on a furling gear have reason to feel pretty smug at this point, as their storm jib can now be simply hanked-on in place of their staysail. "The safest and easiest way to hoist a storm jib in heavy conditions. Simply furl the genoa sheets down to the deck and yank the Gale Sail over the furled headsail, attach its sheets and hoist it with a spare halyard or the spinnaker halyard. The reinforced Dacron pouch easily slides up and down over the furled sail and prevents any accidental unfurling of the genoa. Eliminates the need for a removable headstay. No need to unfurl, lower and pack the genoa to hoist the storm jib. The Gale Sail is a heavy-duty storm jib that can be flown either by itself, or in combination with the reefed mainsail or trysail. The Gale Sail is typically a 50% headsail, when in doubt, go for the larger size." 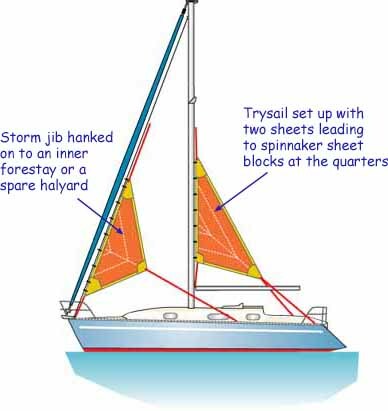 A separate mast track should be provided for the trysail, which should be sheeted through a block on the quarter rather than to the end of the boom. Ideally the boom should be dropped on deck and secured, lowering the Centre of Gravity, reducing windage and negating its skull crunching malevolence, but this won’t be an option if you’ve a rigid kicker. Well before the onset of heavy weather, the sail slides should be fed into the track, a pin inserted beneath to stop it falling out, and the bagged sail secured at the foot of the mast, ready for deployment. A prudent skipper will make sure that there’s an end-stop at the top of the track to save embarrassment in the event of not having properly secured the tack before hoisting. With a careful eye on the weather forecast and due regard to the recommended sailing seasons in various parts of the world, your storm Jib and trysail should see little use. But this can be no excuse for not having things all worked out beforehand, for when you do need your storm sails in earnest it’s a little late to be wondering which end goes up and which corner should have sheet on it.